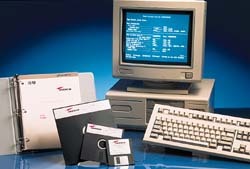 Host-based packages provide local or remote file transfer between IBM� iSeries AS/400 and AS/36 Midrange computers and a variety of DOS, Windows�, UNIX� and Macintosh� formats, enabling users to integrate host data into their desktop applications. Efficient: specific record and field transfer selections supported so that only desired information is transferred. Secure: main menu customizable to display only functions user is authorized to use. Convenient: time and date scheduling allows user to send files at the time of day (or night) most cost-effective. Powerful: multiple device transfers allow user to simultaneously send a file to or from 10 micros with one command. AS/36, System/36 Requirements: Operating System SSP Rel 5 and above. AS/400 Requirements: OS/400 V3R2 and above. 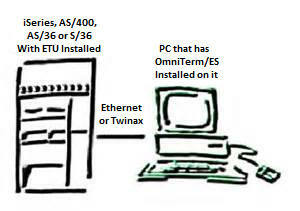 PC Requirements: An NLynx Emulation Product on the PC to interact with ETU on the Host. This can be a USB Twinax Emulation Kit, an ES/PCI Twinax Emulation Kit, OmniTerm/ES Emulation Software, ES/32 Emulation Software, ES/TCP TN5250e Emulation Software. USB Twinax: USB attached Twinax Emulation Kit for 64-bit and 32-bit Windows 10, Windows 8, Windows 7, Vista and XP. ES/PCI PCI EMULATION CARD: 5250 PCI Emulation Card for Windows 10, 8 & 7 (32-bit and 64-bit), 95/98/2000/NT. Requires OmniTerm/ES 5250 Emulation Software.